Context is critical to effective social communication and building strong relationships. At Sprout Social, we’ve taken great care to intelligently provide access to contextual information throughout the app, whether that’s the ability to view a full conversation history when replying to a Tweet or reviewing shared notes and contact details in the integrated social CRM. Today, we’re pleased to build upon that layer of contextual social communication by incorporating Twitter’s latest update, the revamped quote Tweet, into Sprout’s publishing tools. The new Retweet With Comment action replaces the old Quote Tweet option, making it easy to share and comment on a Tweet with just one click. Due to the 140-character limit, a traditional Quote Tweet often required you to shorten the original Tweet and still left you with a very limited number of characters to add your own voice. By seamlessly embedding the original Tweet using a link, the new Retweet With Comment format allows you to use up to 116 characters to provide your own commentary while maintaining the integrity and full context of the original Tweet. Click the gear icon in the top right corner of on any Twitter message. Choose the Retweet With Comment option from the menu. Compose your Tweet, using up to 116 characters. 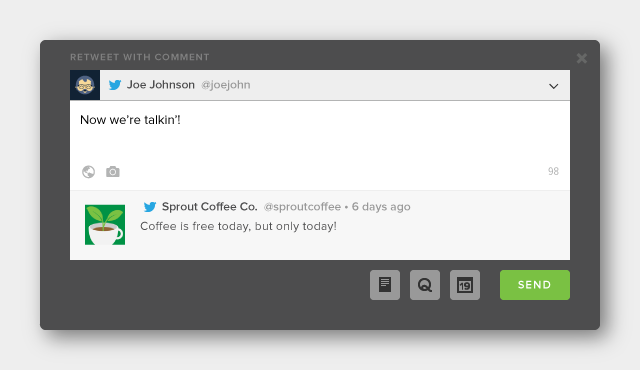 Even though you won’t see the link in the Compose field, Sprout will seamlessly embed the original Tweet when your message publishes. In addition, the original Tweet on which you are commenting is embedded in the Compose window for easy reference and increased context. 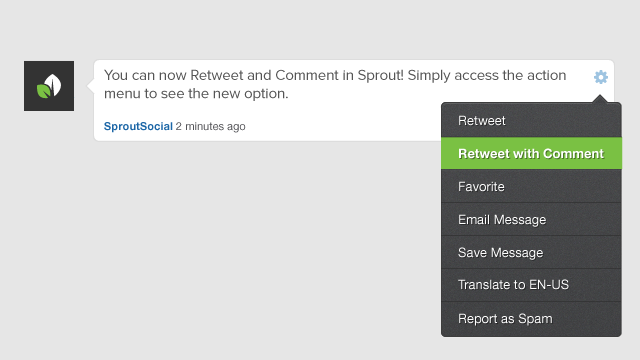 The new Retweet With Comment option is now available in Sprout’s web app and will be released for Sprout’s iOS and Android apps soon. Stay tuned for more updates as we continue to enhance Sprout’s publishing tools and provide the most effective platform to power your social communication.